Silver gets kind of a bum rap. There was a time when silver was king, when men like George Hearst ran roughshod over the wild parts of America looking for it. Sadly, it has fallen out of fashion in recent decades, losing out to gold or platinum. Silver has a lot to offer though, it’s attractive, easy to work with, and its color serves to highlight the intricacies of whatever its shaped into. It’s because of this last property that silver has long been a favorite hue for enterprising car designers to show off their finest work. In fact, the list of beautiful silver cars is so long that friend of V3llum and legendary automotive enthusiast Bruce Meyer, in conjunction with the Petersen and Rolex, had to spend long hours over lists of cars, carefully winnowing out the lesser examples to create arguably the greatest collection of silver-hued automobiles ever assembled. This magnificent exhibition is called Precious Metal, and it promises to serve as a swift spiritual kick to the head that will realign your perception of both the sculptural beauty and outright cost of automobiles. Since getting into the details on each vehicle in Precious Metal would take eons, as each car has a unique history, we’ll focus on our three favorites: the Mercedes W196 streamliner race car, the Horch 853 Sport Cabriolet, and the McLaren F1. 1954 was an exciting year for Mercedes Benz. 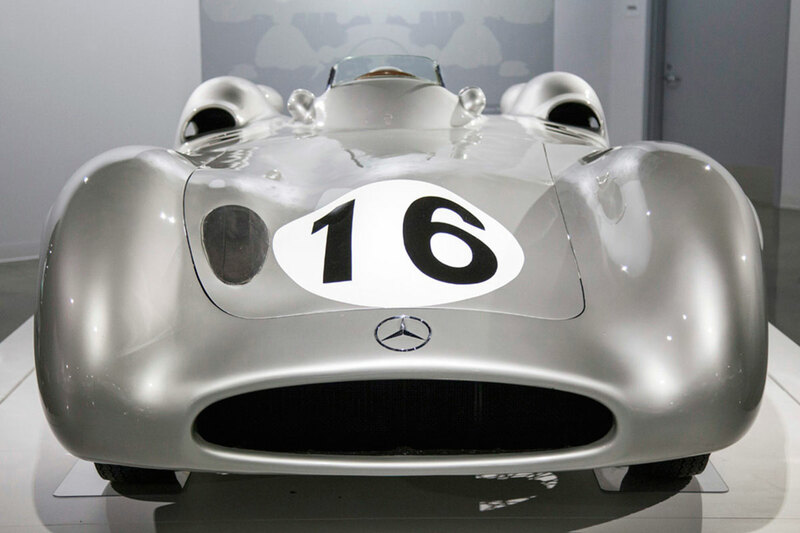 Before the tragedy at Le Mans in 1955, Mercedes was a dominant force in racing. 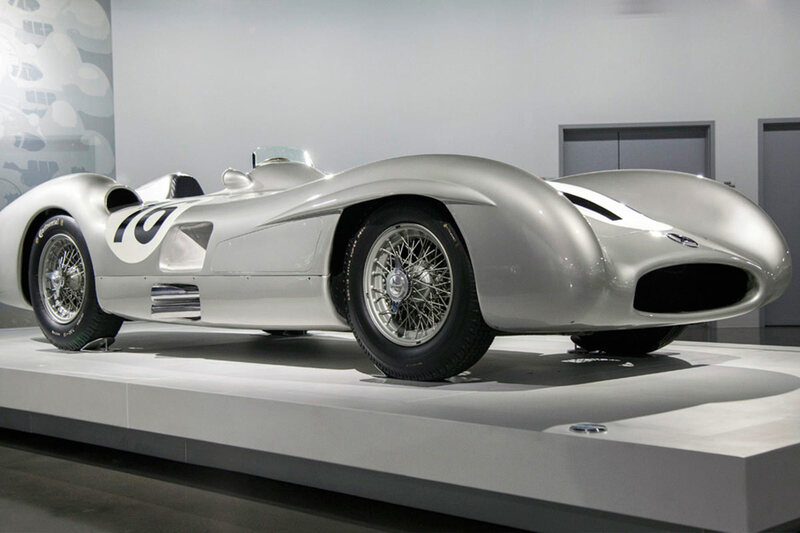 Their deep pockets and considerable engineering prowess allowed them to create some of the most beautiful and technologically superior automobiles of the day with the legendary W196 and W196S serving as the ultimate example of that. Using technology developed during the war, Mercedes created a 2.5 liter direct fuel injected straight-eight engine that made use of desmodromic valve actuation (in which the traditional setup using a spring to close the valve is replaced by a system of dual cams which open and force the valve closed). The little straight 8 was good for nearly 300 horsepower. The monoposto (aka single seat) W196 was raced in two configurations: open wheel and “Monza”. 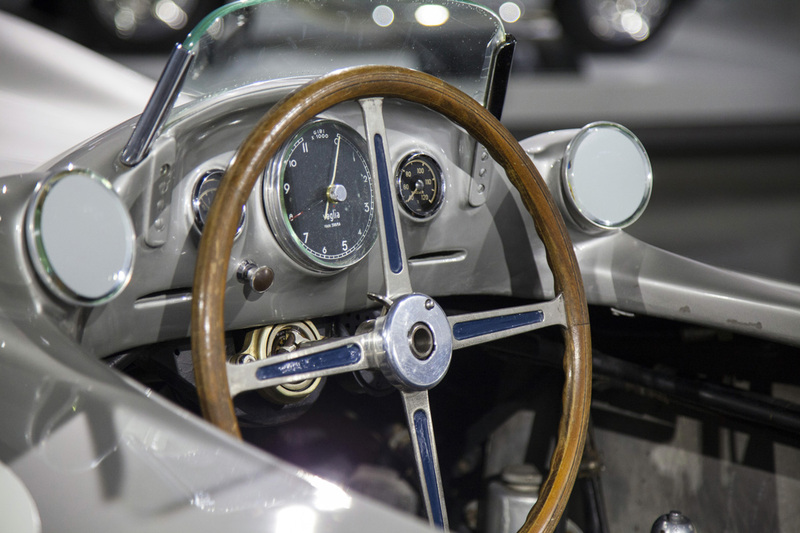 The streamlined aluminum-bodied Monza version, as seen in the Petersen, was raced by Karl Kling and Juan Manuel Fangio, arguably the greatest racing driver in history, to a 1-2 finish at Reims. Hans Hermann set the fastest lap in the car. The Monza bodied car was used only three other times: at Silverstone and Monza in 1954 and again at Monza in 1955. The open wheel version of the W196 was dominant in Formula 1 at the hands of Mr. Fangio and the dual-seat sports version (W196S) was responsible for both Mercedes greatest victory at the Mille Miglia with Sir Stirling Moss driving, and their greatest tragedy in the form of the 1955 Le Mans crash that claimed the lives of 84 people including driver Pierre Levegh and injured more than 120 others. The Le Mans disaster caused Mercedes Benz to pull out of racing as a constructor until 2010. The W196 Streamliner is a staggeringly beautiful machine that even now, more than 60 years after it was built, looks like it's doing 190mph standing still. Everything about it, from the plaid material used for the driver seat, to the vertically stacked side-exit exhaust, to the huge but delicate looking steering wheel is absolutely unique and special. This car alone is reason enough to see the Precious Metal exhibit. 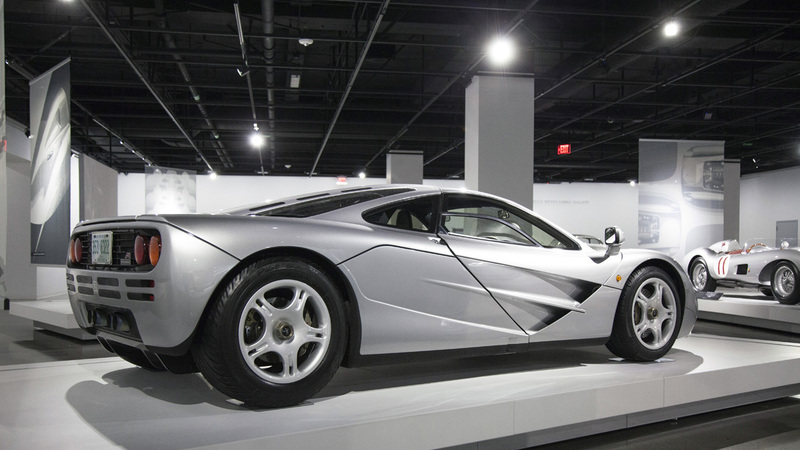 For car enthusiasts of a certain age, there will never be a car as fast or exciting as the McLaren F1. No modern car will ever come close to the F1 in terms of the single-mindedness of its designer. No other modern car truly belies its origin as one man’s relentless quest to close the book on performance cars. Even now in the face of hypercars from Pagani, Bugatti, Ferrari, or any other manufacturer who’s name ends in “I”, the F1 seems exotic in a way that those other cars never could. Everything about it from its center-seat driving position to its lack of driver aids and gold foil lined engine bay spit in the face of compromise. Oh, did we mention it looks spectacular in silver? The McLaren F1 was the brainchild of genius Formula 1 designer, wine enthusiast, and generally grumpy guy Gordon Murray. He wanted to use all of McLaren’s considerable Formula 1 experience to create the ultimate road car. 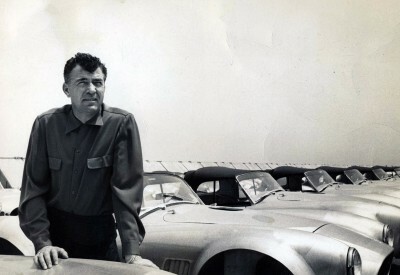 He wanted to use exotic materials that had not yet trickled down to the world of road cars; materials like carbon fiber, titanium, gold, and kevlar. He wanted the car to seat three. He came up with some sketches and presented them to McLaren boss (and also notably grumpy human) Ron Dennis. He agreed and the project began. Murray attempted to leverage McLaren’s racing partnership with Honda to get them to create the engine for the F1. He asked them repeatedly for a 4.5 liter V10 or V12, naturally aspirated, but being Honda, they refused. Eventually Murray reached out to BMW who he knew from his days at Brabham (he designed the BT56, still the most powerful F1 car in history with its turbocharged BMW 4-cylinder that allegedly produced 1400hp in qualifying trim). BMW created a highly tuned 6.1 liter V12 that produced 627 horsepower, a figure that is still impressive today when you consider that it was shoehorned into a car weighing only 2500 lbs. The car was equipped with a six speed manual transmission. 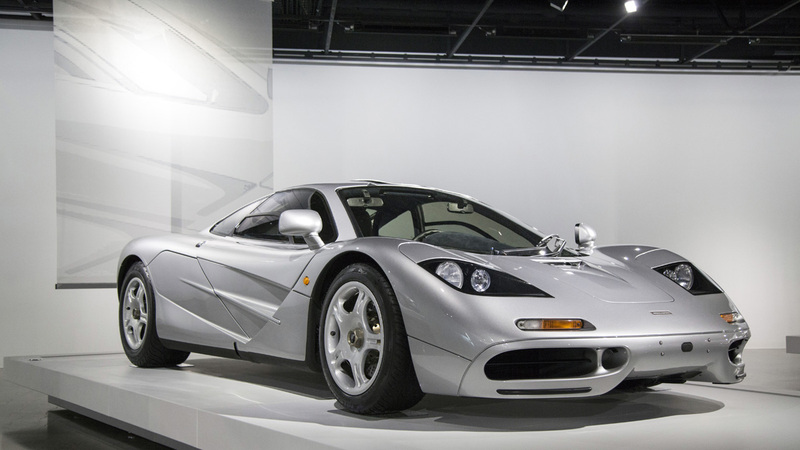 The McLaren F1 was the very first production car to utilize a carbon monocoque chassis. It also used magnesium and titanium inserts to mount the suspension components and the engine subframe to the carbon chassis. This resulted in an absurdly light vehicle with unmatched rigidity and safety. Apparently, during testing in Africa where a driver managed to flip the car several times and was able to emerge from the wreckage unscathed despite only wearing jeans and a t-shirt. The McLaren F1 remains as exotic and exciting and elusive as it was when it was released in the mid-nineties. Low production numbers mean that your odds of seeing one are pretty slim but as a car enthusiast, its something that is worth seeking out. Sadly, in a world of increasingly large conglomerate car companies, there is little room for a car as wonderful and idiosyncratic as the F1. No manufacturer today would get away with omitting a radio because the designer never listened to it. 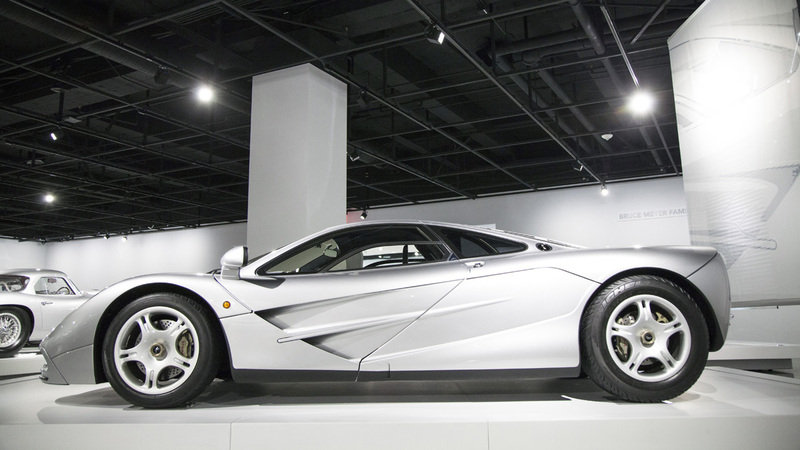 The McLaren F1 represents a high water mark for man’s mechanical achievements. You’d be a fool to miss the opportunity to see it. The period between the world wars in Germany, known as the Weimar Republic, was an incredibly strange, sad, and difficult one. After the treaty of Versailles, Germany was forced to make reparations for their part in the war. These massive fines essentially crippled the German economy and strict sanctions and restrictions meant that they really couldn’t begin to rebuild. This all led to widespread poverty, hunger, and eventually to the rise of Hitler and the Nazi party. It also led to some pretty interesting art and some incredible films, but that’s neither here nor there. Despite all this there was still a German auto industry after the first world war and companies like Mercedes Benz, BMW, Wanderer, DKW and Horch managed to remain at the forefront of the automotive industry. While generally less beloved and renowned than their French contemporaries, the German coachbuilt cars from this period are incredibly beautiful and perhaps the most beautiful of these is the 1937 Horch 853 Sport Cabriolet by Voll & Ruhrbeck. In 1932 Horch, along with Wanderer, DKW, and Audi combined to form Auto Union with Horch positioned as the luxury brand. 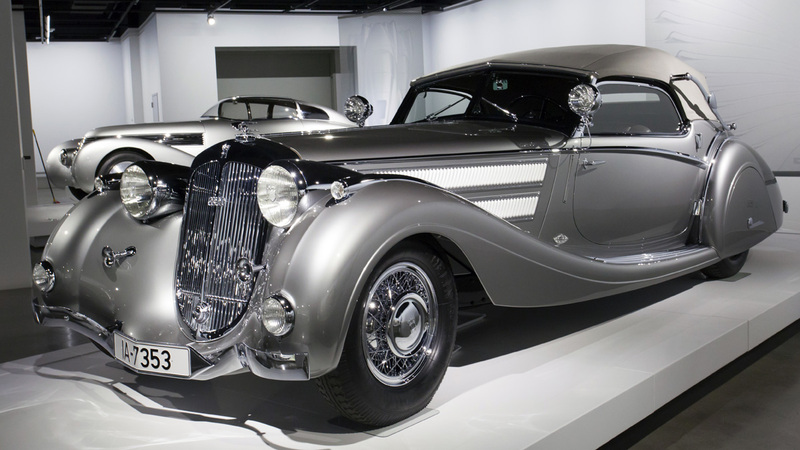 In 1935 Horch debuted the 850 model which was powered by a new SOHC straight eight engine. Shortly after they released the short wheelbase version of the 850, called the 853. The 853 was well equipped and relatively sporting thanks to the powerful straight 8 and combined with competitive pricing, this made the 853 a strong seller. Many of the 853s were sold as chassis and sent to coachbuilders for body work. Many went to German coachbuilders, a few to design houses in France, but perhaps the best known and most beautiful example came from the house of Voll & Ruhrbeck. Founded in 1920 and in business until 1939, Voll & Ruhrbeck made a small number of one-off bodies for clients. Their sport cabriolet body for the 1937 Horch 853 borrowed heavily in its design from famed French coachbuilder Figoni et Falaschi, particularly in its use of chrome. The resulting body is unspeakably elegant with the careful interplay of silver paint and mirror-polished chrome. Other chrome details such as the massive exterior hinges for the convertible top and the sweeping rear fenders that stretch out to provide a place to store the two spare wheels give the car an almost unmatched elegance and presence while still retaining a masculinity that the French cars seem to shy away from. The Voll & Ruhrbeck Sport Cabriolet won Best of Show at Pebble Beach in 2009 and when you are inches away from it, it’s easy to see why. This car is not to be missed. 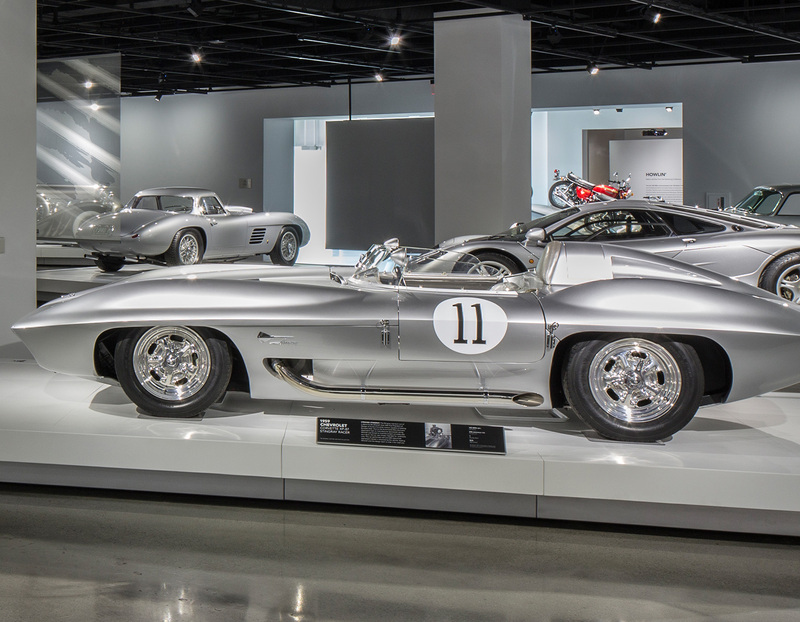 Precious Metal represents a drastic shift for the Petersen Museum, both in the way it displays cars and in the way it will be perceived when compared to other institutions. 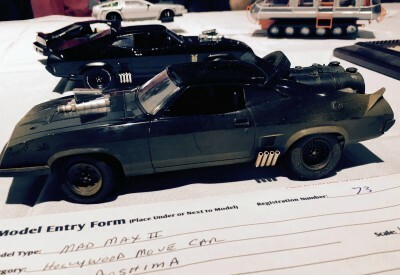 The respect shown to the cars in this exhibit is incredible and presents them as the art they truly are. This exhibition elevates the Petersen from being simply LA’s automotive museum to being one of the great auto museums of the world. 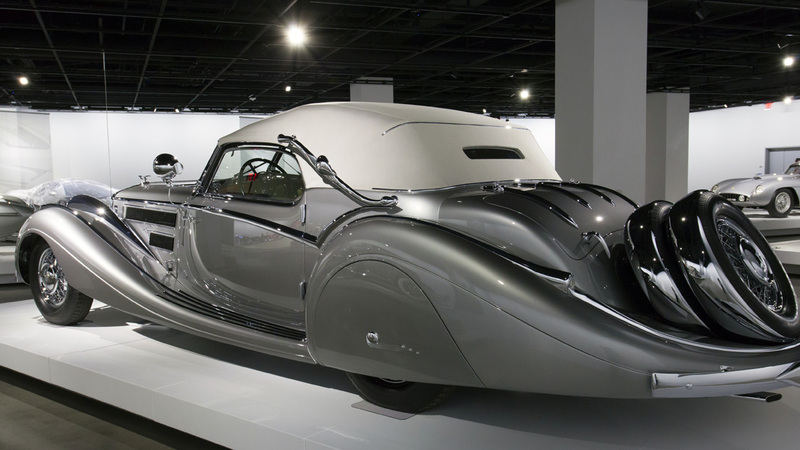 Photos Courtesy of the Petersen Automotive Museum.